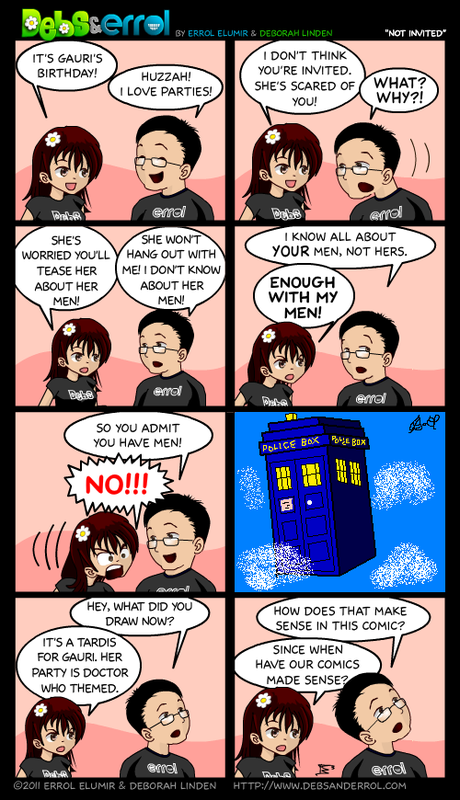 Debs: Umm….Errol, my face in the fifth panel is completely, completely scary. I don’t think it’s been in a comic before. And I don’t think I’ve ever gotten *this* angry at you ever. Errol, you know as well as I do that when Debs is mad she gets quiet and fires lasers out of her eyes. @Debs: Anger (and other major emotions) tend to get exaggerated in webcomics… We won’t count you as being really annoyed until you spontaneously acquire lethal weapons- that was just mildly irritated. So does she really have “men”? Hey man, I’m friendly too! No one’s drawn to me!